Poker Hand Rankings - Do you Know What They Are? Poker Hand Rankings – Do you Know What They Are? We all see poker being played on TV for millions of dollars, and we’ve all imagined what it would be like for us to be in their shoes and win one of those prestigious events. For most of these players, they’ve honed their skills over many years of table time and studying. The one thing that all these players learns first is the poker hand rankings. In other words, which hands beat which hands, etc… . Below I will explain each of the possible hands and where they rank according to strength versus the other hands. This list will apply to all the standard and Bitcoin poker games in which the best 5 cards make you hand. Some of these games include Texas Hold’em, Omaha, Stud, and any other game that is looking for the strongest 5 card hand to win. The list below will start from the strongest poker hand first and end with the weakest poker hand. Therefore, any hand that is placed above another hand on the list will always beat every hand beneath it. For example, the top hand will beat every hand listed beneath it, and the second hand from the top beats every hand besides the one hand listed above it, and so on. Royal Flush – This is the strongest hand you can make with 5 cards. This hand consists having the highest straight flush possible, which is to the Ace. For example, you have the 10, J, Q, K, and A all of the same suite. This hand beats every other hand beneath it. The odds of having a royal flush is 649,739 to 1. Straight Flush – This is the 2nd strongest hand and consists of having both a straight and a flush with the same five cards. For example, you have the 6, 7, 8, 9, and 10 all of the same suit. This hand only loses to the royal flush and beats everything below it. The odds of getting a straight flush is 72,192 to 1. 4 Of A Kind – This is the 3rd strongest hand. This hand loses to the 2 above it and beats everything below it. As the name implies, you have 4 of the same card in your 5 card hand. For example, you have 9,9,9,9 and a 10. Obviously 4 of a kind of 9’s would beat 4 of a kind of 7’s. If 2 players have the same 4 of a kind, the value of the fifth card would determine the winner. For example, you end up with 9,9,9,9,10 and your opponent has 9,9,9,9, J, his 5th card, aka kicker, would play and win the hand. The odds of getting 4 of a kind is 4,164 to 1. Full House – This is the 4th strongest hand and consists of having both a pair and 3 of a kind with your best 5 cards. Suits doesn’t mean anything with these hands. For example, you have a 9, 9, and 7, 7, 7. The strength of a full house is determined by your 3 of a kind first. If two players both have full houses, the player who’s identical 3 cards are higher than the opponents 3 of a kind would win. For example, if your hand is Q,Q,Q, 8, 8 and your opponent has J,J,J, 8, 8, you would win. If you both have the same 3 of a kind, then it would go to the pair that was higher. For example, if you end up with 9,9,9,5,5 and your opponent ends up with 9,9,9,4,4 you would win. The odds of getting a full house is 693 to 1. 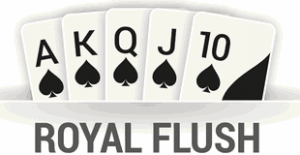 Flush – This hand is about halfway down the list but is still a winning hand most of the time. It loses to everything above it but beats everything below it. To have a flush, all 5 of your cards must be the same suit. For example, if you end up with 7,8,Q,2,4 and all in spades, that would be a Q high flush. If more than one player has a flush, it would be the player with the highest card of that suit that would win the pot. The odds of getting a flush is 508 to 1. 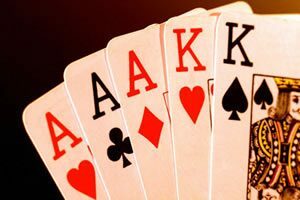 Straight – This hand is the 6th strongest hand but still wins many pots. To have a straight you must have 5 cards that connect in value. For example, you end up with 4,5,6,7,8. Suits does not matter in this case. If they were all the same suit, you would have a straight flush that’s listed way above. It goes without saying that if 2 players both had straights, the player who’s straight was higher would win the pot. The odds of getting a straight in poker is 254 to 1. 3 Of A Kind – Even though way down the list, this hand will win most pots. If you have 3 matching cards of the same value, you have 3 of a kind. For example, if you end up with 8,8,8,10,J, you have 3 of a kind ( 8’s ). Like a couple of the other hands, whichever player’s 3 of a kind hand is higher would win the pot. The odds of getting 3 of a kind is 46.3 to 1. 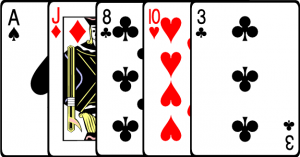 2 Pair – This hand is way down this list but still beats the couple of hands below it. Simply put, if you end up with 2 different pair with your 5 card hand, you have 2 pair. For example, you have 5,5,6,6,9, you would have 2 pair ( 5’s and 6’s ). If more than one player has 2 pair, the player with the highest pair would win the hand. If those players had the same 2 pair, then the player with the highest 5th card, or kicker, would win the poker hand. The odds of getting 2 pair is 20.0 to 1. 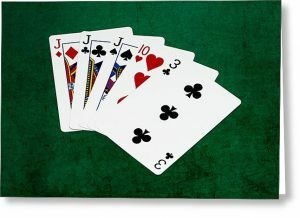 1 Pair – This hand only beats a hand without any pair, and loses to every poker hand above it. This hand consists of only 2 of your 5 cards being the same. For example, you end up with 2,2,6,9,Q, you have a pair of 2’s. If more than 1 player has only 1 pair, then the player with the highest pair wins. If more than one player has the same pair, then it would go to whichever player had the next highest card, and so on. The odds of getting 1 pair is 1.37 to 1. High Card – This hand is at the bottom of the barrel when it comes to poker hand rankings, and very rarely wins the pot. Basically, if you don’t even end up with a pair, all you have is the highest card that makes up your hand. For example, you end up with K,J,9,8,5. All you have is King high. If for some reason more than 1 player gets to showdown and neither has even a pair, the player with the highest card wins. The odds of ending up with no pair is 0.995 to 1. Now that you’ve familiarized yourself with the poker hand rankings, you’re on your way to learning more about this beautiful game that we all love so much. Of course it will take lots more knowledge than just knowing what beats what, but that’s the foundation that everything is built on. There’s many online sites where you can play real poker for free while you learn the ropes and get comfortable at the tables. Once comfortable, you can deposit money and play for real at any of the Top Rated Poker sites on my Bitcoin Poker page, or make the trip down to your local casino or poker room.